Ami Aspelund was born on September 7, 1953 in Vaasa, Finland. While her sister Monica represented Finland during the 1977 Eurovision Song Contest with 'Lapponia', Ami followed in her footsteps in 1983 with the song 'Fantasiaa'. Monica finished on 10th place, Ami did only slightly worse, finishing on 11th place. 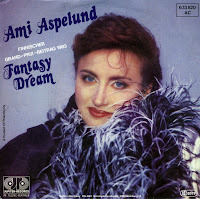 The single 'Fantasy dream', released in Germany, features both the English and Finnish versions of the song. It's a great upbeat track, and one of the better Finnish contributions to the Contest during the Eighties.